“It’s an African song that means ‘We come to greet you. We welcome you,’” Raymond Wise, the ensemble’s director, told the students. It was a good way to begin a program about the history of African-American music. When talking about Black History Month, Wise said, the story really starts all the way back in Africa, before people were shipped to the U.S. as captives and slaves. “When they came from Africa, they brought a lot of wonderful, rich cultures and practices with them. They brought with them their music, their dance, their African drumming and their languages,” Wise said. This was only the beginning of the story he told for about an hour, weaving music and history together in an assembly that has become a Black History Month tradition at University School. Maggie Olivo, a music teacher at the elementary school, said this is the third or fourth year the choir has performed there, and that Wise brings an animated vivacity to the performance every time. “He puts it in such clarity for them,” said Olivo. She and Wise, who teaches in Indiana University’s African American and African diaspora studies department, put the first program together with the help of IU education professor Stephanie Power-Carter. Wise walked into the crowd and spoke energetically, keeping all eyes of the students on him. He explained to students the important role spirituals played in the lives of American slaves, saying they boosted morale, eased the workday and even conveyed secret messages. He asked students to imagine what captives must have felt as they sang spirituals such as “Steal Away,” which could either express a longing to run for freedom or signal an intent to bolt for the Underground Railroad. “Who can tell me what the Underground Railroad was?” Wise asked. Hands shot into the air. From the spirituals grew other kinds of music, Wise said: blues and jazz, gospel, vaudeville and musical theater. He explained that students at African-American colleges used to perform rearranged spirituals on concert tours to raise money for their schools. Some of those songs are the same pieces kids in the Monroe County Community School Corp. district might have sung in their music classes. 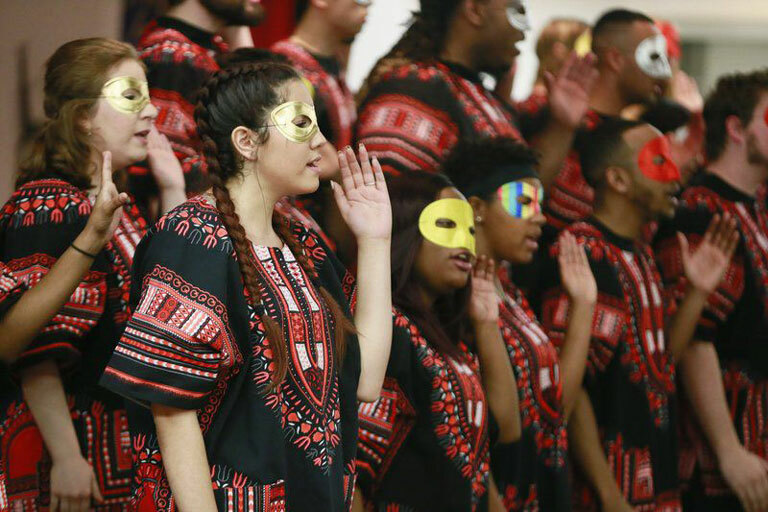 In addition to highlighting African-American history and music, University Elementary principal Gretchen Morgan said, the performance re-emphasized the importance and value of the school’s diversity. Because of its proximity to IU, which attracts professors and students from all over the world, University Elementary’s students hail from more than 30 different countries. “Whenever we have opportunities to connect with various diverse groups who bring different heritages and legacies to us, we embrace that opportunity,” Morgan said. Wise began winding down the performance by homing in on that idea of community. He and the ensemble led the students in singing “It Takes a Village,” a song Wise wrote himself and which students had been learning in music class. The song says that every person in a community has a role to play in raising the community’s children, and he taught the students hand motions to go along with the music as the kids joined in with the college singers. “In the community, we all have special gifts that we can share, and we can all help everyone to grow and to be better,” he said.